IMSI Design, the leading solution provider in CAD and Mobile based software for AEC sectors, just released TurboCAD v8 for Mac. This newest 3D modeling application contains some advanced 3d modeling and rendering features, greater performance and improved compatibility with AutoCAD(R) and 3D Printers. TurboCAD v8 series of products consist of TurboCAD Mac Pro, TurboCAD Mac Deluxe 2D/3D, and TurboCAD Mac Designer 2D. Superior ACIS 3D solid modeling engine and file filters promoted to R24. Latest Quad Mesh Tools (Pro only) for producing quad mesh primitives, extrusions, coverts, lathes, and meshes through points. Newest Subdivision Mesh Tool (Pro only) will generate organic shapes efficiently by making a quad mesh smoother. Better Associative Mesh Booleans (Pro only) now can be recorded and available through the part tree. Latest Woodworking Joint Tools (Pro only) for generating rabbet, dado, miter, tongue and groove, and dovetail joints. Sophisticated 3D Linear Duplicate Tool produces copies of an object on the basis of stipulated rows, columns, and spacing. Superior 3D Polar Array makes 2D and 3D patterns of objects into a primary point or object. Better DWG/DXF filter having compatibility with AutoCAD 2013. Greater STL filter for getting authentic output to 3D printers. TurboCAD Mac Pro v8, $499.99 USD. TurboCAD Mac Deluxe 2D/3D v8, $129.99 USD. TurboCAD Mac Designer 2D v8, $69.99 USD. 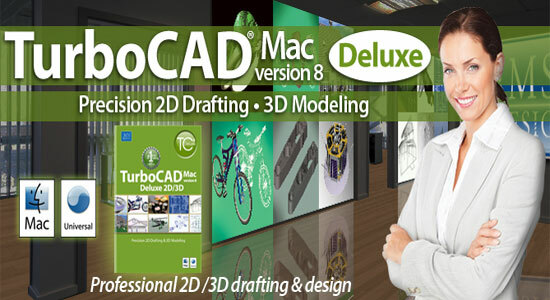 The CAD professionals can access complete TurboCAD Mac v8 series through www.TurboCAD.com and the Apple Mac App Store.